Herpes infections or simply Herpes, medically known as herpes simplex virus or HSV, is a common virus and is often unrecognized. An estimated 80% of American adults have had the oral infection (causing cold sores on the mouth and lips) with herpes and as many as 1 in 4 adults may have had the genital infection (typical lesions in the genital area) with herpes without even knowing. After the initial herpes infections, the virus will stay dormant in the nerves and will reactivate occasionally during the infected person’s lifetime, causing the typical lesions: a blister or a cluster of blisters which are filled with a clear fluid, and an irritated, painful skin surrounding these blisters. Conventional management includes antiviral medication such as acyclovir or famcyclovir, however, these drugs are not eradicating the virus, but rather improving the symptoms. On the other hand, natural supplements such as coconut oil have been shown to have the ability to actually destroy the herpes virus, and also prevent secondary bacterial or fungal herpes infections. Coconut Oil contains several healthy compounds, including two fatty acids with antiviral qualities: lauric acid and capric acid. Depending on the source/brand of the coconut oil, it will contain between 40 to 50% lauric acid and 8 to 10% capric acid. When these two fatty acids are metabolized in the body, they convert into monoglycerides, which are glycerol molecules named monolaurin and monocaprin. These two monoglycerices have been shown in research studies to cause disintegration of the viruses by destroying the fatty coat surrounding the herpes virus as well as HIV and Cytomegalovirus. Therefore scientists have been looking into using the antiviral quality of coconut oil. Monocaprin, one of the monoglycerides of capric acid and lauric acid, were found to be the most active of all the lipids tested, causing a greater than 100,000 fold reduction in the virus (HSV type 1) titer in 1 minute at a concentration of 20 mM, is the result of a study featured in October 1999 in “Journal of Pharmaceutical Sciences”, and conducted by a team of researchers from the University of Iceland, Reykjavik. Based on this study , the authors suggested a topical gel be developed having capric acid and lauric acid as active ingredients to be used for preventing sexually transmitted diseases such as herpes virus, HIV, gonorrhea and Chlamydia. Herpes infections are sometimes followed by secondary infections with bacteria or fungi. Fortunately, coconut has the ability to help in these cases as well. 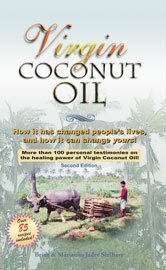 According to a study published in March 2011 issue of “Asian Pacific Journal of Tropical Medicine”, coconut has been found to have not only anti-viral qualities, but also many other medicinal properties such as antibacterial, antifungal, antiparasitic, antioxidant, and immune system boosters. The authors of this study believe that coconut palm is a true ‘Kalpavriksha’ (the all giving tree in Indian culture) and possesses strong medicinal and nutritional qualities and can be used for both treatment and disease prevention. As a practicing physician in Internal, Pulmonary and Critical Care Medicine I realized that the successful treatment of chronic illnesses cannot rely on drugs alone. An integrative approach including dietary modifications, food supplements and herbs often provides extraordinary results.